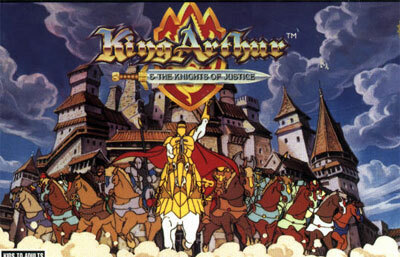 King Arthur & the Knights of Justice is a top-down action game. It might be mistaken for an RPG, however the abilities of characters do not change over the course of the game. Players control Arthur King and can recruit two additional party members from the knights. Each knight has his own statistics in various areas including: Life Force, Defense, Strength and Speed. These party members are computer controlled with their own energy bars. Arthur can move up, down, left and right, block with his shield and parry with his shield. Arthur can swing his sword at any time but the damage inflicted depends on how much strength bar he has. The strength bar replenishes itself naturally over time, but is depleted every time Arthur swings his sword. Each knight including Arthur has a health bar, when this bar runs out, the knight is defeated. It can be restored by returning to Camelot or using items such as healing herbs. Arthur can carry a variety of different items accessible from the menu. Other menu functions include looking at the map, changing preferences and reviewing the statistics of the knights.